bmi Regional to be sold? AND FINALLY: Hold it in! 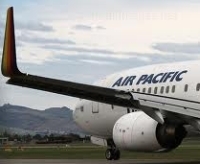 With an appearance at World Travel Market in London next week Air Pacific, the airline of Fiji, has announced the arrival of its fourth Boeing 737-800 in the Fiji capital of Nadi. The aircraft replaces the carrier’s single Boeing 767-300. Air Pacific is owned by the Fijian government (51%), Qantas (46.32%). Air New Zealand and the governments of Kiribati, Tonga, Nauru and Samoa each hold minor stakes. The aircraft will be used mainly for the second daily service between Nadi and Sydney (except Sundays) from mid-January 2012 as well as other local routes. The 767 will be replaced on the Hong Kong route by one of two Singapore Airlines leased Boeing 747s operated by the airline. With the much larger 747 the frequency will change from three times to twice a week. 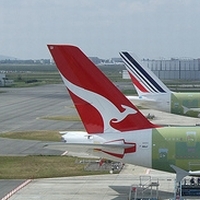 From 2013 the venerable Boeings will be replaced with three Airbus A330-200s. Hertz has announced the use of Chinese automotive company BYD's eBus-12 at Los Angeles International Airport (LAX), claiming it as a first by a rental car company. The BYD bus is able to run 150 miles on a single charge in urban conditions, more than enough for Hertz's use at its airport locations, and its energy consumption is less than 100 kWh per 10kms. At Los Angeles the bus shuttles car hire customers between the terminals and the company's rental facility. It saves on average US$76 per day, per bus in fuel costs! AirAsia X has successfully transferred from Stansted to Gatwick. The airline will be flying five times a week to Kuala Lumpur, moving to six flights a week by mid-December. Commercial Director Guy Stephenson said: “Gatwick offers an attractive proposition to airlines and their customers. We are within an hour’s drive for around 15m people and we have fast and excellent rail connections to central London. The combination of these factors means that AirAsia X are in a better position to increase traffic between the UK and Malaysia now that they have moved their London ‘home’ from Stansted to Gatwick.” Vietnam Airways has also chosen Gatwick (see this issue). Arik Air, Nigeria’s largest commercial airline, has formally been announced as the International Air Transport Association’s (IATA) newest member five years to the day after it made its maiden flight. The IATA membership follows one year after Arik satisfied the requirements to be registered on the IATA Operational Safety Audit’s (IOSA) register. Arik is now also a member of the IATA Billing & Settlement Plan (BSP). “I would like to grow to 120m, 130m passengers,” said Mr O’Leary. In 2010-11, 72.1m passengers flew with Ryanair. Mr O’Leary insisted he would only buy aircraft at “cheap prices”, but with full order books neither Airbus nor Boeing are likely to be in the mood for a discount deal and would also have delivery problems. Most industry experts believe that ordering the new Chinese C919 ‘paper aircraft’ very risky. Ryanair has an all-Boeing fleet, and Mr O’Leary acknowledged it faced increased operating costs if it bought aircraft from a different manufacturer. 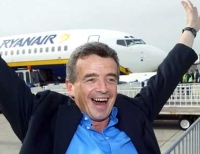 Ryanair’s expansion in recent years has focused on Italy and Spain, and Mr O’Leary said the airline now had big growth opportunities in Scandinavia and eastern Europe. Maritim Hotels, Germany’s largest privately owned operator of conference facilities, has opened a new hotel in the Yuhong district of Shenyang (China), a city not far from the North Korea border. Built to international 5-star standards, the property features 631 state-of-the-art bedrooms and suites. It boasts a modern swimming pool and wellness area, as well as sophisticated German and Chinese speciality restaurants and an all-day dining restaurant. 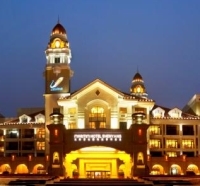 It also has extensive event and conference facilities, with space for up to 1,400 people in the grand ballroom and a further 15 conference and meeting spaces. 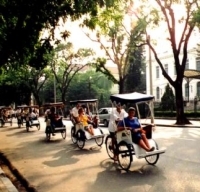 Shenyang is considered to be the cultural and industrial centre of Northeast China and describes itself as “a city full of vitality”. The opening comes after the success of Maritim Hotels’ first property in China, an elegant venetian-style property in Sanshan, inland from Shanghai, called Maritim Hotel Wuhu. With expansion in mind the luxury hotel chain will open a further two Chinese hotels in the coming months, in Anting, and Changzhou. Singapore Changi Airport has welcomed the arrival of Russian carrier Vladivostok Air. One of Russia’s most established airlines, it will operate twice-weekly services between Singapore and Vladivostok via Hong Kong. Vladivostok Air will use an Airbus A320 aircraft in a two-class configuration on the route. The new service gives an alternative routing from Europe to the Russian Far East. We never gained a response to the question whether it is true that Ryanair are taking out a loo, but travellers with a delicate bladder should not be unduly worried. The number of seats on a Boeing 737-800 is fixed by safety rules and not the whim of a managing director. The maximum number allowed is 189 and that is it. Just like the idea of standing up throughout a flight. It’s illegal. But that too did get media coverage. UK Olympics Minister, Jeremy Hunt, will open World Travel Market 2011 next Monday (7 November) at Excel in London’s Docklands, a venue for the 2012 Olympics. Does the Minister’s appearance at the event mean a change of Government policy to aviation with the majority of inbound tourists (and for that matter outbound too) arriving by air? Or is it just a sop for the Games? We could have written his speech. If our guess is correct he will praise the travel industry and steer very much clear of Air Passenger Duty (APD) and the Government’s airport policy. Of course he will emphasize the Olympics. He will note that tourism contributes £115bn each year to the UK economy, and acknowledge it has the potential to be one of the fastest growing sectors in the years ahead. However Mr Hunt’s words are a full seven days away. Another Minister involved with the travel trade is actually introducing herself today at a major gathering – Justine Greening the newly appointed Secretary of State for Transport. Her platform is the Airport Operators Association Conference. What a pity she is not speaking on the second day when Colin Matthews (BAA), Willie Walsh (IAG) and Dan Moylan (TfL), are amongst the participants. This Monday is really very busy as it sees the of publication of ‘Flying in the face of jobs and growth’, a report published by the British Chambers of Commerce (BCC). The comprehensive 56-page document sets out recommendations that would see the UK’s aviation infrastructure improved to support growth in the private sector. They include building additional capacity at our airports and scrapping proposed increases to APD taxation. The report also includes analysis which demonstrates that the lack of a clear aviation policy means the UK could miss out on millions in GDP, and much needed jobs. According to the BCC, Heathrow is still the number one as far as international traffic is concerned but we are 4th with seat availability from China and 5th from Brazil, both rapidly developing economies. It paints a possible bleak future. Two events, the airport operators gathering and the opening of World Travel Market, a week apart, are both supported by Government Ministers. Both are vital get-togethers. The hosts should not be full of platitudes when speaking to their Right Honourable guests. They should include words of listening quality. Comment on what is known as “the scoping document” is now closed. Instead of waiting until sometime next spring for its assessment the Government should recognise that air travel is in crisis. Prioritise the review. Let us see some results before Christmas. Tell the Ministers such. Rumours persist as AERBT goes to press that bmi Regional is to be sold to Scottish interests as owner Lufthansa begins to dispose of some of the parts of bmi that do not fit into its master plan for the loss making airline once owned by Sir Michael Bishop. The names of Graeme Ross and Ian Woodley have been mentioned. Both were involved with bmi Regional’s predecessor, Business Air. Based in Aberdeen, bmi Regional presently has a fleet of 19 Embraer regional jets seating up to 50 passengers. bmi said the sale includes all the shares of bmi Regional and all assets used by the unit, including the aircraft fleet, as well as the route network and staff. "The intended sale of bmi Regional is part of the strategic review of bmi," said the airline's Chief Executive, Wolfgang Prock-Schauer. "It is our goal to find sustainable solutions for all parts of the bmi business and we, as well as the shareholder, continue to assess options." Samsonite, better known for hold and cabin baggage, introduced a range of electric powered gadgets designed to meet the needs of the modern traveller. 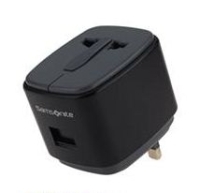 Priced from just £12 they include adapters, chargers and a retractable pocket mouse. In addition there are handy Business Tech packs, Travel Tech packs, and what is described as Essential Tech packs. Whilst the more glamorous First and Business Class seats get the media exposure it is those at the back that actually make for the big volume. German company Recaro are rightly patting themselves on the back for resounding success in the “Focus Open – International Design Award Baden-Wuerttemberg” competition. 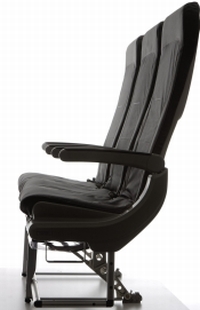 The outstanding design quality of the new Recaro BL3520 Economy product convinced the panel of experts to choose the seat for top honours in the “Transport/Traffic” category. 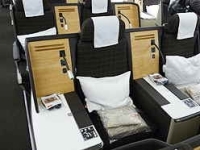 The swing to twins continues with South African Airways replacing its older generation A340s with brand new A330-200s on its non-stop London – Cape Town route. 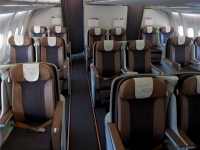 All aircraft feature a two-class configuration: Business Class and Economy Class. Beijing will become Swiss International Air Lines latest destination next February as the airline adjusts its range of service to comply with demand during the 2011/2012 winter timetable period. The reduction of selected frequencies and withdrawal of flights to some destinations is being offset by an increase in frequencies on other routes. As of February 2012 Swiss will introduce new Zurich – Beijing and Geneva – Nice services. Flights from Zurich and Geneva to London, Moscow and Madrid will be increased. Beijing thus joins Hong Kong and Shanghai as the airline's third destination in China. It already serves Hong Kong and Shanghai. The Qantas strike and shutdown is off following a ruling by Fair Work Australia, a government sponsored independent tribunal, on Sunday. The day before the airline’s CEO Alan Joyce grounded the Qantas Group and threatened locking out all those involved with the dispute from 20:00 local time today. This followed weeks of disruption by the airline’s unions and threats by management. By the end of last week there had been 129 cancelled flight with another 387 delayed and 70,000 passengers had been affected. Four Boeing 767s and three Boeing 737s remain grounded. The cost is put at £50m with passengers flocking to other airlines. Reports from Australia indicate that the decision of the panel is seen as a victory for the airline which is making big losses on its international routes. Biman Bangladesh’s first new Boeing 777-300ER has arrived in Dhaka after a 16hrs 8mins non-stop flight from Seattle. Another will follow shortly and a further two next year. They will replace elderly DC10s. The airline has four 787s on order, these replacing the carrier’s Airbus 310s. 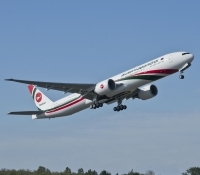 Biman Bangladesh Airlines currently flies to 18 international destinations in Asia, Europe and the Middle East. The Bangladesh aircraft is Boeing 777-300ER number 300, the most popular version of the 'Triple Seven', the best selling of the model range. In total some 1,288 variants of the 777 have been ordered, the current backlog standing at 325. Airlines (and road companies) are not the only transport operators who are being affected by ever-stringent air pollution rules. The Passenger Shipping Association put out a statement last week, ahead of a UK Parliament Transport Select Committee meeting, suggesting that the public could see increased prices and greater road congestion due to the introduction of new rules. Ferry companies including Brittany Ferries, DFDS Seaways, P&O Ferries and Stena Line say the new rules will have far-reaching implications. Fuel costs will increase by up to 87% and many ferry services on the English Channel, North Sea and in the Baltic face closure. They also warn of the threat to seafaring and port jobs if ferry services close down. The International Maritime Organisation and EU member states want ships to burn fuel with a low 0.1% sulphur content from 2015 instead of the 1% sulphur content in use today. Sir Michael Bishop should be a familiar name to anyone in aviation over the last nearly 50 years. 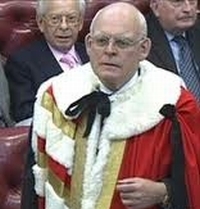 Somehow AERBT missed his raising to the peerage (and congratulations) in February as Baron Glendonbrook of Bowdon in the County of Cheshire (where he was born in February 1942). He has contributed to the arts and education over the years and is Chairman of D'Oyly Carte. In 1963 Bishop joined the Manchester-based Mercury Airlines, a small scheduled and charter carrier, which was taken over by British Midland Airways (now bmi) in October 1964. By 1969 he became General Manager and three years later Managing Director. The rest is aviation history with a succession of mergers and takeovers until the final selling of the UK’s largest privately owned airline and second biggest slot holder at Heathrow to Lufthansa for a reputed £300m+. 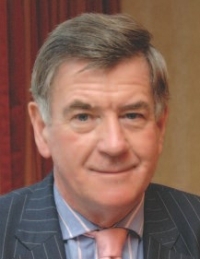 The present bilateral airline arrangements between the European Union and the United States owe much to the efforts and perseverance of Lord Glendonbrook. However when the deal was made bmi declined to invest in transatlantic routes, the by now Sir Michael deciding it was all too risky. Independent Russian carrier Transaero Airlines has signed a Memorandum of Understanding (MoU) with Airbus to acquire four A380s becoming the launch customer for the SuperJumbo in Russia, the CIS and Eastern Europe, according to Routes on Line. The tentative agreement was signed on Friday (28 October) by the carrier’s Chief Executive Officer, Olga Pleshakova, and Christopher Buckley, Executive Vice President Europe, Asia and the Pacific of Airbus. Transaero plans to start operations with the A380 on its “long-range network of high density routes from Moscow,” according to the manufacturer. The aircraft will feature a three-class cabin layout, seating about 700 passengers, one of the most densely configured examples. Hyatt Hotels Corporation has announced the opening of Andaz Shanghai, as mentioned in February by AERBT, introducing the lifestyle brand to Asia. The newly constructed 28-storey hotel is located in Xintiandi, a landmark entertainment area in the heart of downtown Shanghai and a short walk to the Metro and Huai Hai Zong Road, one of the city’s main shopping areas. Bookings have now opened for Sky Team member Vietnam Airways new non-stop service between Gatwick and both Hanoi and Ho Chi Minh City which is launched on 8 December. ‘Open jaw’ itineraries will be available. The airline is at World Travel Market (AS960). Boeing 777-200ER aircraft will be deployed on the route, configured with Economy, Deluxe Economy and Business Class cabins – all with seat-back entertainment systems. Operating non-stop from Gatwick’s North Terminal, the new service will offer a reduction in journey time of up to seven hours for UK passengers transiting through South East Asia or the Middle East. More Brits are choosing to begin their ocean cruise holiday from a UK port than ever before, according to figures released by the Passenger Shipping Association (PSA). In spite of the gloomy economic outlook 2011 has been another strong year for the UK cruise industry with growth of more than 5%. 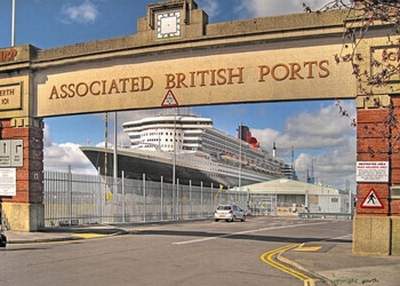 The trend for British port departures is predicted to continue as the number of passengers taking a cruise holiday slows after a period of sustained growth. This year, more than 760,000 passengers will have started their cruise holiday from one of the 20 UK departure ports, sailing to destinations including Russia, Scandinavia, the Norwegian fjords, Iceland, the Mediterranean, America and closer to home, the coast of Britain and Ireland. This is a 28% increase for cruises departing from British ports over the last two years indicating that the high cost of flying (APD) to an overseas boarding point is having its effect. Holland America Line sails 15 ships of varying sizes, ranging between the Nieuw Amsterdam (2,106 passengers) and the Prinsendam (835). 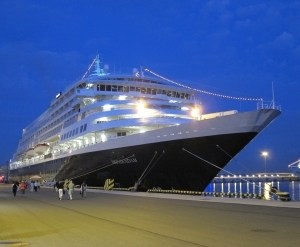 Having now travelled on five HAL ships, I enjoyed the Prinsendam more than the others. Not all the ships are equal in their amenities due to their differing sizes and the Prinsendam was not built for HAL, so her fittings and layout varied from other ships of theirs that I have sailed on. These differences enhanced our cruise experience! The staterooms were fitted with walk-in closets, refrigerators, etc and all of them opened from a small passageway off the main corridor thus ensuring greater privacy. The flat screen TV and DVD player could be enjoyed any time as there is an extensive DVD lending library. There was also wireless internet connectivity. Our cabin, forward on the lower promenade deck had an uninterrupted view and was most convenient. Many extra benefits were provided, such as substantial sail away prizes at the first port, two chances for us on this voyage. Really decent prizes were awarded for Trivia quizzes and other competitions; twice including universal power adaptors, selling for US$30 in the ship’s shop. Who would cherish a ship’s pin realistically? Although the ship had only one specialty restaurant, the Pinnacle Grill, it mattered little. 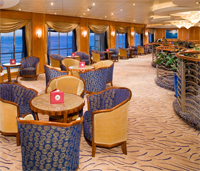 This locale was transformed into ‘an evening at La Cirque’ (top NYC restaurant) each cruise. The elegant La Fontaine Dining Room had a wonderful menu; no items were repeated on a cruise and the quality and service were excellent without exception! Dining was always a great experience and we found open seating dining to our liking, rather than fixed early or late seating. There was also the overwhelming Lido buffet with so many choices, a terrace grill, a café and very extensive 24-hour room service choices. All dining matters are under the guidance of a Culinary Council and well known Executive chefs. The ship’s artwork and antiques, beautiful floral arrangements, elegant furniture and stylish public rooms, made us feel most comfortable in these pleasant surrounds. There are two banks of lifts and the several wheelchair users were able to access all facilities. There is one general store and a jewellery shop which also sold perfumes etc. It is easy to get around this ship and the only time I felt crowded was at the initial lifeboat drill! 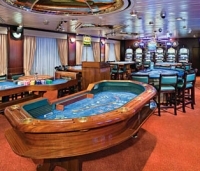 There are many good facilities on the Prinsendam such as the Spa and Salon, Fitness centre, two swimming pools, whirlpool, hot tubs and so on. There were many daily classes in yoga, Pilates, tai chi and health issues. The Library is an excellent one for a ship of this size; it also held many computers with internet access, which was, as usual aboard ship, very pricey and slow. Classes were available with chefs, on wine and food, floral arrangement, cake decorating and naturally, napkin-folding, all in the Culinary Centre (which doubled as the movie theatre) There were digital workshops – ‘techspert’ classes on editing photos, video etc. Other activities included trivia quizzes, name that tune quizzes, bridge instruction and play, dance classes, deck games, bingo, and daily religious services as well as a beautifully catered Jewish Sabbath service each week (Jewish people don’t drink a lot but do enjoy their food). 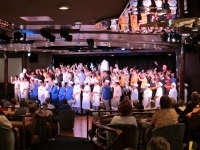 The Showroom at Sea was the venue for full-scale musical and dance productions by a very talented and experienced troupe. There were also individual performances by comedians, vocalists and pianists which were delightful. The ship had a movie theatre (for which my husband suggested enhancements of the sound and picture quality), a casino, an excellent and talented orchestra plus a classical trio and a small band. There was a piano bar, with DJ and dancing as well as other activities. Port information was disseminated by a staff member; shuttle buses were usually provided in port to the centre of town. We were given information including ‘Lodestar’ maps of each port which unfortunately lacked important details for personal touring and they were not to scale. Shore excursions were handled efficiently and they were quite satisfactory; in particular an evening tour arranged solely for passengers of our ship to the Hermitage in St Petersburg. Missing were learned lecturers on the special area of the Arctic that we were exploring – geology, history etc. A member of the excursion staff gave two lectures on the Vikings but they were of a very general nature and boring. What a missed opportunity! This seems to be one of many small cutbacks which have been made and are so noticeable to regular cruisers. The room stewards also clean more staterooms, the table stewards handle more tables, cocktail parties have been replaced with a drink before a scheduled show to see the captain and senior staff lineup! We are HAL regulars as noted. The product is very good but HAL have to be careful. The ship is only as good as the last voyage. We will be returning. Evelyne Perks Cohen – a habitual traveller living in both the USA and Australia.